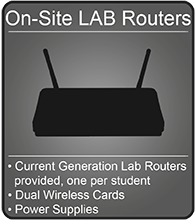 Training Courses - Link Technologies, Inc.
Link Technologies, Inc., offers the best private RouterOS training. 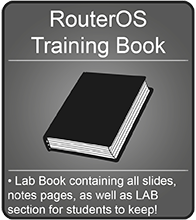 Our 5-Day RouterOS Workshop allows your engineers, techs and IT Professionals to learn RouterOS in a week long course, designed with lecture time, lab workbooks, and comprehensive coverage of the RouterOS software. Our trainer, Dennis Burgess, is the author of "Learn RouterOS”, the first and only RouterOS book on the market. From years of experience running Wireless ISPs, running servers and WAN networks in the enterprise market, and consulting for countless WISP and ISPs using RouterOS, Dennis Burgess is one of the best in the industry. What better person to handle the training of your staff! We offer several packages in RouterOS Training. This includes comprehensive venue setup, tear-down, and training, to your companies own organized training program. 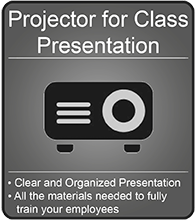 We will customize the training for your organization, or use tested training materials to help your students get the most out of the training class that you organize. We can assist as little or as much as you wish. We also offer certification courses for RouterOS. 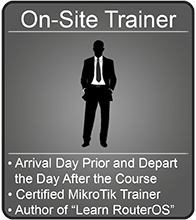 These include virtually all of the training programs that RouterOS offers, and all of these are MikroTik Certified Programs, not just a "basic” course offered by someone that has no standing with MikroTik. These are the real deal! At least 6-12 months working with RouterOS. Knowledge of ARPs, TCP/IP Routing and subnetting. Prior wireless deployment experience a plus. 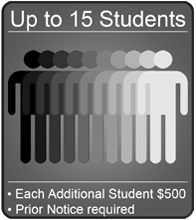 *Reseller Rights - Allows you to "resell" a training course to other individuals from other companies or businesses. You can resell seats at your pricing. You will handle all resell costs.